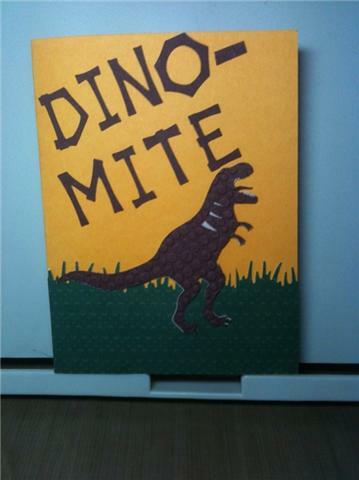 This card was made using the Dinosaur Cartridge. The words "Dino-Mite" are from the Life's a Beach Cartridge. This was made for my grandson, Braydon. 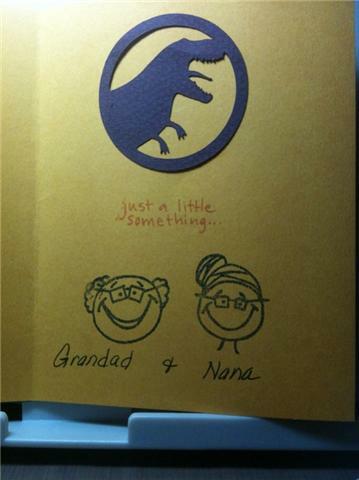 He loves dinosaurs and loves to imitate them by roaring and stomping around like a dinosaur. The first picture you see is the inside of the card. Again, the dinosaur tag was from the Dinosaur Cartridge. The card was stamped using a clear stamp set from Joanne's. I believe it is called Family. The grass was created using a Martha Steward punch.